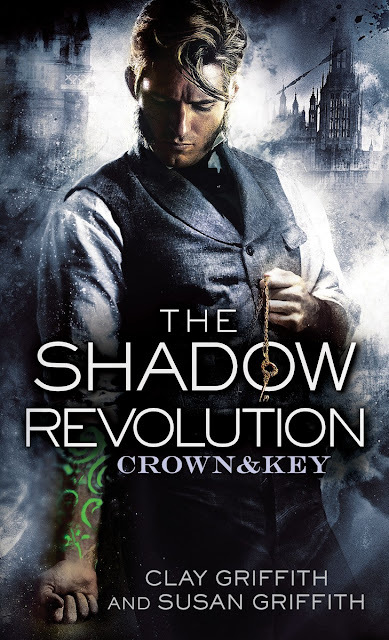 I jumped at the chance to read The Shadow Revolution, because I really enjoyed the other of the Griffith's series that I read, Vampire Empire. Plus, I really love a good steampunk novel done right. I'll blame it on Sean Connery and The League of Extraordinary Gentlemen. :) (Yes, I know the movie is terrible, but it's Sean Connery). While The Shadow Revolution had a few hiccups for me, it's a great start to a new steampunk urban fantasy series. I was so hooked that I willingly read the little teaser chapter for the next book. I never do that, by the way. I'm impatient and can't bear to have the rest of the book. One chapter is not enough. Lucky for me, the next book in the trilogy, The Undying Legion, will be out in less than a month. Since The Shadow Revolution is urban fantasy with witches, I was a happy reader. There could have been a little bit better world building; the world of Vampire Empire is much better detailed. But, that world is also a completely alternate world, where I'm guessing this one is only slightly different. There's no real explanation as to whether magical beings are the norm in England at this time. No one is really shocked at the happenings, but Simon and gang do attempt to at least cover most of their shenanigans. But, someone would have to see giant werewolves and those creepy white beings shuffling around. Also, how do the only four "good guys" with magical/alchemical/badass talent manage to literally walk into each other (or at least, stumble upon each other whilst fighting bad guys) and become fast friends? I'm reading an ARC so this may change by the time of publication, but I thought that some of the dialogue needed some editing. It was a little stilted in parts. There were also several parts in the first couple of chapters where Simon would utter something along the lines of a "non-English word". I'm probably being nitpicky, but I feel like the language should have been described. Maybe pick a mage language, make one up, or simply write the word without giving the language. Basically, anything but saying he muttered a "non-English word". I'm impressed that the heroes of the story are generally an unlikeable lot of characters, yet I was still drawn in and invested in the outcome of all of them. Kate was an odd character. She's a little too brash and loudly opinionated for the time frame. But, maybe in alternate 19th-century London women aren't as repressed. She's also prickly, a know-it-all and rash. She gets points for risking herself in order to save those she cares about, but she was missing that something that normally makes me fall in love with the tough, know-it-all urban fantasy heroine. Nick and Malcolm were also prickly and testosterone filled. However, whereas Malcolm grew on me with his sarcasm and competence, Nick just made me want to yell at him to shower and stop being a selfish, lazy, shifty slob. However, all my quibbles aside, The Shadow Revolution is a pretty fast-paced jaunt through an alternate London. There's a set up for some sort of quest to figure how to work a magical object or an evil magical society, which are also things I love in fantasy, so I can't wait to see where the next book leads us. According to the synopsis there's going to be an evil mummy and snake demon, and I don't remember the last time (if ever) that I've read about evil mummies. (Now I want Yummy Mummy, and I'll be extremely sad if it's not available this Halloween). To satisfy FTC guidelines, I am disclosing that I each received a copy of the novel from the publisher via NetGalley in exchange for an unbiased review. This has in no way affected the outcome of my review. This sounds promising for a first in series. There is definitely enough here to make me want to give it a go to see where the next book will go. Thank you for your review, Amber. You should definitely check it out if you like steampunk! Thanks for stopping by!